Waiting for answers to RFIs and Submittals can delay trades and hold up the project. At Fieldlens we believe in a more efficient flow of information. That's why we've created post flags for RFIs and Submittals - just like safeties and deficiencies. When you create an RFI or Submittal in Fieldlens and add an assignee, they will get notified immediately. And by sharing with the trades, they’ll get the answers when you do! Important note: RFI and Submittal post flags are only available on projects crated after 1/16/2018. 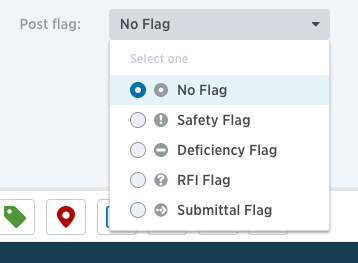 Click Add RFI flag or Add Submittal flag. Fieldlens will maintain these flags after you’ve posted - speeding things up if you’ve got to create a number of RFIs in a row, for example. Tap the flag to remove them at any time. You can select a RFI or Submittal flag from the Post flag drop-down when creating a New Post. Each and every RFI and Submittal post will be assigned a unique ID in Fieldlens. If you create your first RFI within a project, for example, it will be RFI #1 with the post status of open, resolved, closed.